Most will find the online method the easiest. Once set up, it’s very easy (details below). In all cases, please give us 3 days’ notice to issue AND 2-3 days for the chemist to process. Don’t forget about public bank holidays – get your prescriptions in advance. Please don’t leave things until the last minute. There are always a few patients who do this and this creates unnecessary and avoidable pressure on the surgery during these busy times. Ashcroft surgery has an in-house pharmacist who you can talk to if you have a query about medication. Some medication are given to you by the doctor as a one off. Please do not ask for these via our repeat prescription service. If you need them, speak to our pharmacist or doctor. Our medical computer system is called SystmOne. Did you know you can book and cancel appointments too? Get a username and password through our reception staff (only needs to be done the once). Log on by clicking the blue area below. Tick the medication you want from your medical record and the press send. Your prescription will be ready after 48 hours (2 working days). You will need the right hand side of your green paper prescription slip. Use this green slip and tick what you require. See the picture below to help you understand various parts of the prescription note. Then give it to us and allow us 2 days to process your request. Either post, hand-deliver or fax the green repeat medication slip to us – or get a relative, carer or friendly neighbour to do this for you. •	There is a prescription box inside the building for use during work hours. Outside of work hours, use our letter box which can be found on the left hand side (side wall) of the main entrance. Click here to sign up for Online and Text Services. Can I request medication over the telephone? We do not accept repeat prescription requests via the telephone. There are two reasons for this. Ordering via telephone can lead to mistakes – especially if we end up mishearing what you have said. We need to keep our telephone lines free so that patients can seek urgent medical advice. Please help us by not engaging our telephone lines unnecessarily. If you feel your circumstances are exceptional, then please talk to our Practice Manager, Chris Rushton. Can I request medication via email? We do not accept medication requests over email. The reason is that there is a high chance of errors being made if you spell things incorrectly or specify the wrong dose of quantity of items needed. Now that we have a very secure, reliable and easy online system to help you re-order your repeat medication, we don’t see the need for a more riskier email system. Therefore, we urge you to use our online system. It really is very easy and you will love it. If you would like to sign up for this, please speak to a member of our reception staff, or alternatively click here. Please order you medication in good time. Do not leave things til the last minute – it creates unnecessary pressure on the surgery which makes our lives very difficult. It is unfair on us and our other patients that need attending to. This is particularly important if a public Bank Holiday (including Christmas and New Year) is coming up. The surgery is always incredibly busy during these times. Please help lessen the pressure on us. Ideally, you should order your medication 1 week BEFORE they are due to run out. This will give the doctor enough time to review your medication and process your prescription. When you put in an repeat medication order, remember to allow us 48 hours (2 working days) to process it. So please do not ring up asking about the prescription before this time. Whether you order online or via the paper method, please indicate clearly how you plan to collect your prescription. If you plan to collect the prescription from the surgery, write ‘COLLECT’. If you plan for the chemist to collect your repeat slip, please write the name of the chemist you have asked to get it for you. Please try and collect your prescription before 6pm – the surgery will be closed after that time. We review your medication on a regular basis – at least once a year. But sometimes, you will be asked to see the doctor for a formal medication review. A medication review helps us to double check which medication you are taking (or should be taking) and to cross off any that are now unnecessary. It’s a safety mechanism to ensure you are on the right things. It is also an opportunity to review your medical condition(s). It’s also an opportunity for you to ask questions about your health or medication. In general, it is a good thing! Please be aware that a doctor may want to cut down some of your medications – sometimes it is not good to be on too many medications – they can start interfering with each other and possibly give you some side effects. Where can I find details of my next Medication Review date? The date of your next review will be printed at the bottom of the repeat request slip (i.e. 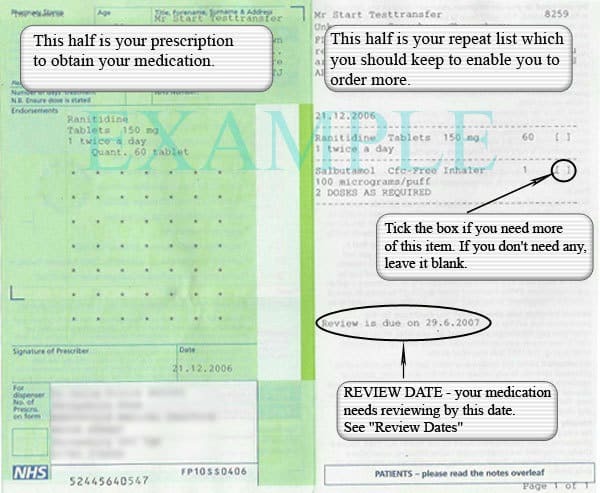 the right hand side of your green prescription slip – see the diagram on the right). Sometimes, a medication review can be done over the phone. However, if you have an appointment with a doctor and you know that your medication needs to be reviewed soon, please discuss this with them. The doctor may be able to do both things. How do I get a pharmacy to pick up my prescription and deliver it? First of all, ring your pharmacy and ask if they offer a collection and delivery service. If they say yes, then you will need to sign an agreement with them (they will bring a form for you to sign – it’s a simple form). The pharmacy will then let us know. There are a number of pharmacies that do a collect and deliver service. Here are a few of them. You can choose to go to whichever pharmacy you want to. And you can change them as often as you want. So, don’t feel obliged to stick to a pharmacy if you are unhappy with their service. You choose, it’s your right. What’s the current prescription charge? Tell me about exemptions too. In England, there are extensive exemption and remission arrangements to protect those likely to have difficulty in paying charges (for things like NHS prescription and dental charges, optical and hospital travel costs). Ask your pharmacist, dentist and optician if there are any that apply to you. As this information changes from year to year, please click here for the latest information on prescription charges. Prescription prepayment certificates (PPCs) offer real savings for people who are on lots of medication. However, if you feel you are on lots of medication, it might be worth booking an appointment with the doctor to see if all are really necessary. If the doctor says they are – then get a PPC. If you tend to pay for 4 or more prescription items in 3 months, or more than 14 items in 12 months, you may find it cheaper to buy a PPC.